The 2nd project of the Gratitude Enquiry has just come to completion. 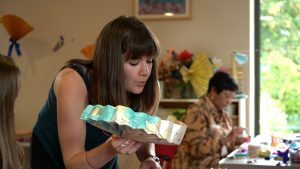 Fanmail took place at Sydenham Garden, a beautiful oasis in South London, where people go to garden, sing, make art and grow back to health after, or in the middle of physical and mental health challenges. We met for four Mondays with 9 participants, doing that wonderful combination of skills learning, chatting, thinking, and being quiet in the company of other people. Folding the pleats is not without its difficulties, especially for those who struggle with dexterity, or, who are used to doing things fast and imprecisely. 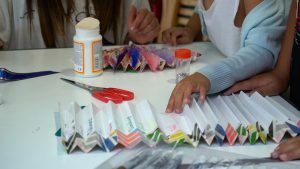 One participant wrote afterwards; I was pleased I could enjoy the precision of making ‘sharp’ folds without getting too stressed – it works anyway, even if you are by nature ‘a bit sloppy’! We introduced the idea of including messages on the fans in the second week. The seed for the idea had come from what was a thank you letter, folded in to a fan shape because it was ‘Fanmail’. But we knew that we had to introduce the message idea carefully, so that people could participate in this bit to the extent and the depth that they wanted. In my research I had read a paper on ‘Gratitude and Happiness’ (Watkins, Woodward, Stone & Kolts 2003). These scientists had conducted an experiment in which they set out three tasks; to think about someone to whom they were grateful; to write about their gratitude to someone; to write a letter to someone to whom hey were thankful that would be sent. In terms of positive effect on the participants, the thinking exercise was twice as beneficial as the letter writing. The letter provoked some anxiety about the possible reception of the thank you, which the other two exercises did not. 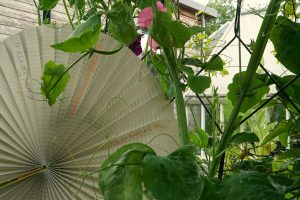 I wondered how this exercise might help us, and this coincided with development of a set of ways to make fans developed by the two visual artists, Mia Harris and Anna Sikorska. The different ways of folding offered the opportunity to seal a message completely in the fan, so that it is present, but never visible; the opportunity to write a message clearly visible to any viewer, and the opportunity to write a message and the fold the paper in such a way that only the recipient would know where it was and be able to peep inside. This offer allowed a huge variety of response; public thank yous, messages to family and pets who had died, private messages including messages to oneself, and the possibility to , as one participant put it “lay something to rest”.